I have this thing for meatloaf and meatballs…that should be apparent by my myriad meatloaf recipes on here (ie. Cheeseburger Meatloaf and Meatloaf with Carrots and Potatoes being my two favorites). 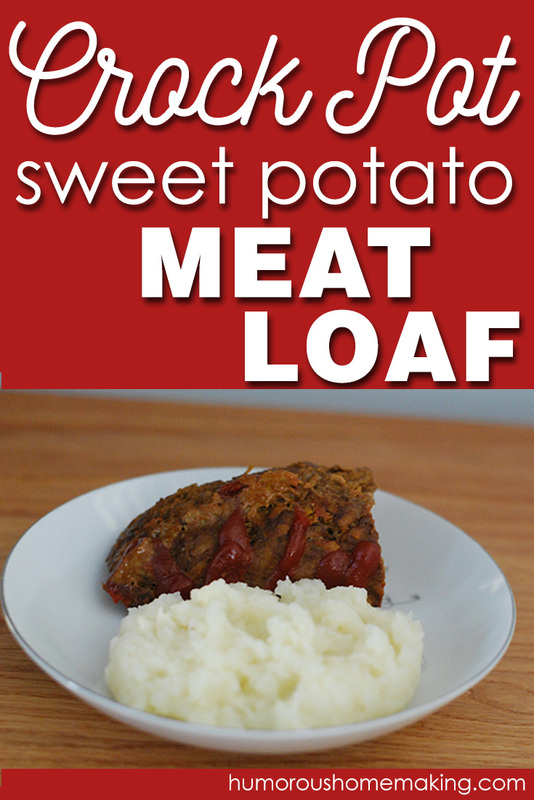 But this Sweet Potato Meatloaf… y’all. It’s a home-run. Where some women can’t say no to chocolate, I can’t say no to meatloaf. It’s bad…really bad. What’s worse is if it’s a meatball. I might be stuffed silly from 8-10 large meatballs…but that little meatball will look at me and say “Hey…I’m just a little ole thing – you can eat one more.” And I do. I’m so weak. I need AA for meatloaf. 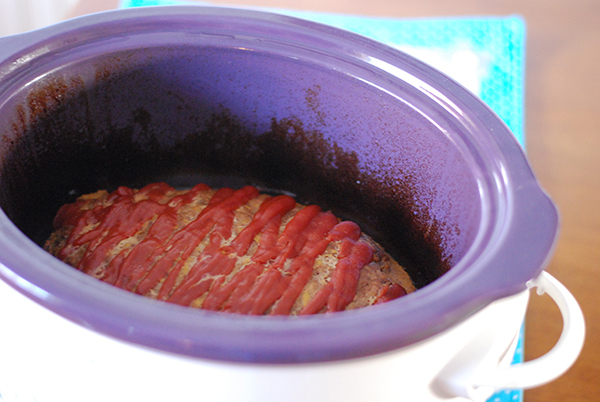 I seriously hit the ball out of the park with this Crock Pot Sweet Potato Meatloaf – it’s now my #1 favorite meatloaf recipe…and that’s saying a lot! This recipe was born when I saw the idea for putting a small amount of grated carrots into meatloaf to use as a filler…but I didn’t have any carrots – I had sweet potatoes. AND who wants to put a piddly little ole 1/3 cup of grated veggies in their loaf? If I’m gonna do it, I’m gonna do it big. Go big or go home. Embrace the big meatloaf. I ended up adding 3 cups of grated sweet potato to this meatloaf – and it was a thing of beauty. There were tears. I ate a second helping. And I cried some more. Then later, I ate most of the leftovers myself. I am not ashamed. Meat is just so stinkin’ beautiful. Now, as usual, I used ground venison. You could use beef or even ground turkey. The potato is going to keep it nice and moist (blech!) no matter what meat you use. However, depending on the type of meat you use, you might end up with a bunch of grease. When I use venison, that’s not a problem – but it’s easy to drain off no matter. Mix up your stuff in your meatloaf mixing bowl – because everyone has one of those, right? And then press it into your crock. 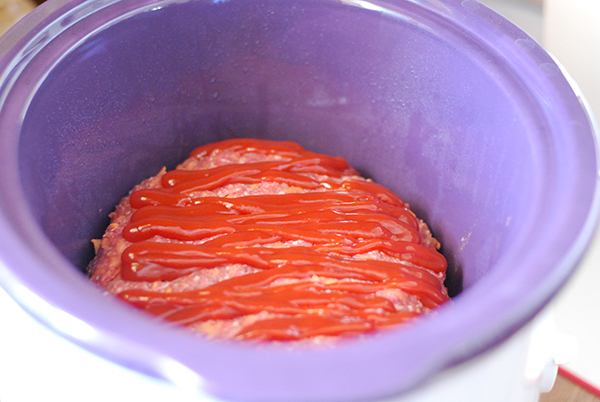 I do grease my crocks for meatloaf, even though they’re going to get really greasy – I err on the side of caution…I don’t like spending my evening scraping the crock. Plop some ketchup on top because ketchup is beautiful too. Meat + ketchup = true love. I used my 5 quart crock, but a 4 quart would work as well. If you doubled the recipe, you could use a 5-6 quart. Whatever floats your boat. This makes about 6 large servings – because we like meat around here. If you eat smaller servings, it would serve 8. 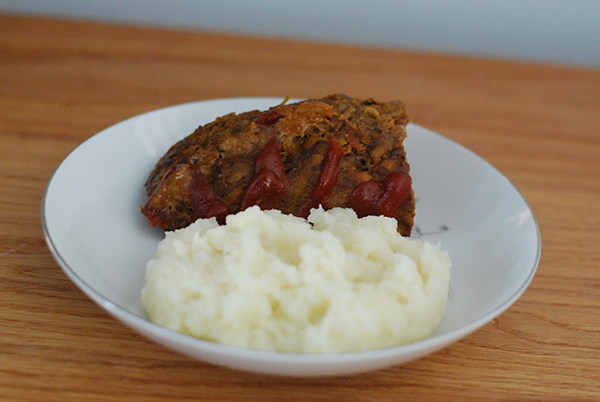 But really…meatloaf should be eaten in large quantities. Go big or go home. I <3 meat. Combine all ingredients except ketchup in a mixing bowl. Press into greased 5 quart crock. Turn to LOW and continue to cook for 6 more hours. Aww I miss this love of meat ? Why did I not find you this morning when I was preparing my conventional meatloaf??? I have plenty of sweet potato!!! Grrr! I can’t wait to try this recipe! I also used ketchup on the top and realize it is not THM friendly, but hey, meatloaf needs ketchup and I did not have tomato paste on hand to make my own. Guess I will start that once I use up my Sam’s supply of ketchup…that could take awhile. Thanks again for all you do, this site and THMer’s like Gwen and others have changed me life. I just saw that Julie’s father from a new lighter life just died suddenly from a farm accident, did you know? I didn’t start THM until January – and not everyone that reads my blog is THM. 🙂 So, I try to keep everyone happy. Enjoy! Stacy – I made this today as we had a bass lesson and play rehearsal and…well – lots of kid activities on the schedule – so a super, busy, like normal, night. The amazing smell of dinner hit us when we walked in the door – and the entire family cheered for you. What a HIT! I did substitute homemade BBQ sauce for the ketchup as there are no ketchup fans in our house. A pound of Grass fed beef mixed w/a pound of ground buffalo & shredded sweet taters? It was delish! Thank you for the amazing recipe! Going grain-free we haven’t had meatloaf in a while as I hadn’t found the right “filler”. This is definitely a new fave! Hooray!!! That gives me BIG smiles! Just made this for dinner and I have never had such a quiet table! My boys were stuffing their mouths! Thank you for a way to sneak in some needed veggies. You made me hungry all over again. I love your build up to this recipe. You had me hooked before I even got to see what was in it! (You are a wonderful writer.) It is printed and I can’t wait to try it-just bought ground turkey on sale, so looking forward to tomorrow’s dinner. 🙂 Yum! I love beef, but I love a good turkey loaf too! You can’t tell it’s sweet potato in there!! The very picky hubs who can tell when I use 1/2 turkey with the ground venison we use said that this was the best meatloaf I have made for him by far! (Used all ground beef this time.) It is difficult to find stuff that is gluten free for me that he likes too. And the kids LOVED it. Win all-around!! Thank you soooo much! I LOVE meatloaf and meatballs too! Whenever I go to cracker barrel, I can’t not order it. I love trying new ways to make it too. I’ve used black bean and corn salsa as a mix in, and then topped with a tomato salsa, hubby loved that one. Love the idea of sweet potatoes for filler because they are so good for you! Also, if you don’t like the word moist, maybe you could try juicy, since meat is supposed to be juicy, right 😀 Or not…juicy meatloaf….hmmm? Yes, juicy….that’s my new word for moist (blech!). I love meatloaf! Thank you for a new recipe! Yum! I will be taking it BACK to your inspiration and make it with carrots since those are GAPS legal. 😀 I need a meatloaf that does not use bread crumbs without subbing coconut or almond because that does not sound good to me. 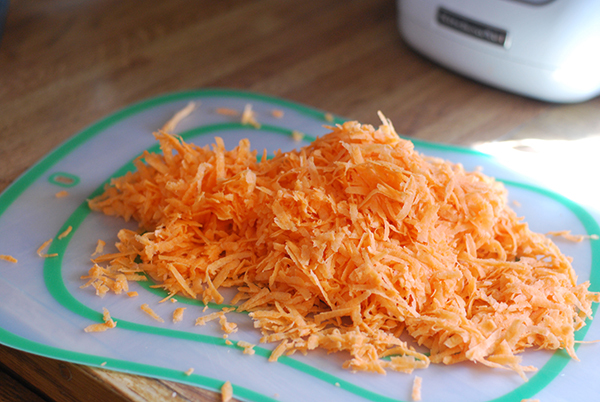 I plan on doing your recipe… just with carrots. 😀 Mark can not have even that though for now so I will have to wait. This sounds delicious! My only question before I try to pass it off to my hubby (who detests sweet potatoes): what does the added sweet potato do to the flavor? 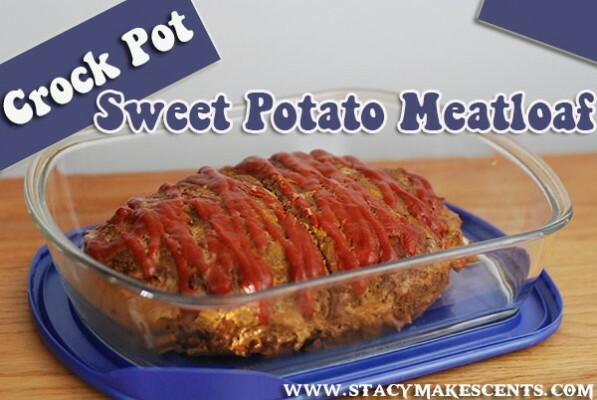 Is it obviously a sweet potato meatloaf? A very good thing – especially about meatloaf. YES! I should use that word instead. How do you grate the sweet potatoes? You know, I was going to make meatloaf today. Might just try this out. I also LOVE meatloaf!! We have a lot of venison to use up, so this is a recipe I will try over the weekend, thank you!! !